USS Washington ACR-11. 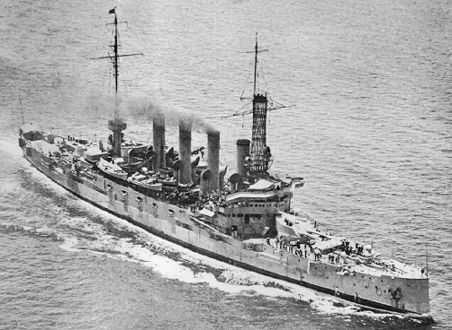 She was latter re-named USS Seattle to free up the name for a new battleship. The fast burning, smoky propellants of the 1800s gave way to the slower burning "smokeless" powders near the turn of the century. These propellants gasified almost completely and could accelerate a projectile all the way along a gun barrel of 40 or more calibers long. Thus the high-velocity naval gun was born. A side benefit was the flatter trajectory, leading to more accurate firing which in turn led to centralized fire control. In the case of the USN, the development of smokeless powder led to a new generation of long-barrel naval guns, including the 10"/40 (25.4 cm) Mark 3. This weapon was one of the post Spanish-American War high-powered guns and armed the USN's last generation of armored cruisers. This was the last 10" (25.4 cm) gun built for the US Navy. Consisted of A tube, jacket, four hoops, locking ring and a screw box liner, all manufactured from nickel-steel. ^Wartime stowage was 72 rounds per gun. This data is from "Ordnance Data Sheets" of 1905 as published in "US Naval Weapons" and is for face-hardened Harvey plates. Data is for the older shell design. This data is "Elements of US Naval Guns" of 1918 as published in "US Naval Weapons" and is for the 7crh projectile. Data is corrected for angle of fall and may also refer to harder armor than used for the 1905 data. 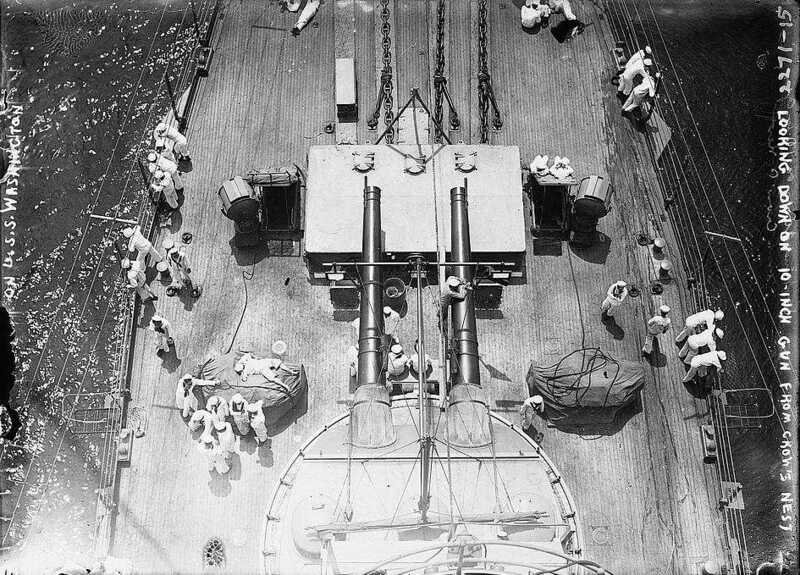 Each gun was provided with a electric hoist that delivered two complete rounds per minute. Automatic shutters were fitted in the ammunition supply tubes between the turret and magazines in order to increase flash protection. Handling rooms were equipped with a tracked trolley system that helped in moving rounds to the hoists. 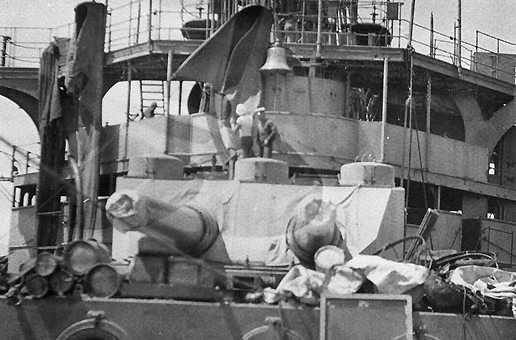 Turrets had a longitudinal bulkhead separating the guns and a turret officer booth. These turrets used the "grass-hopper" counter recoil system whereby a spring box, located under the gun pit, was connected via two heavy, pivoted arms to the gun yoke. See sketch below. 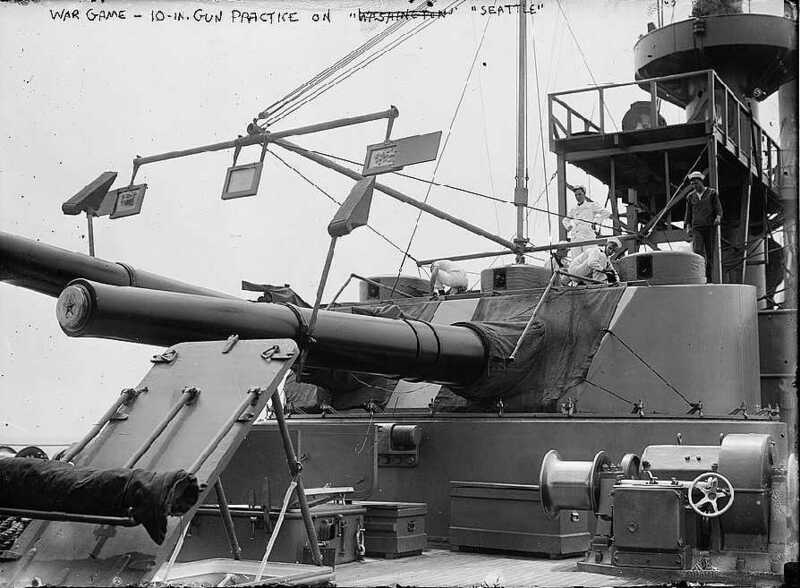 10"/40 (25.4 cm) turret on USS Washington ACR-11 circa 1915. Note that the top of the circular barbette is clearly visible. Bain News Service Photograph as Library of Congress Photograph ID LC-DIG-ggbain-09055. 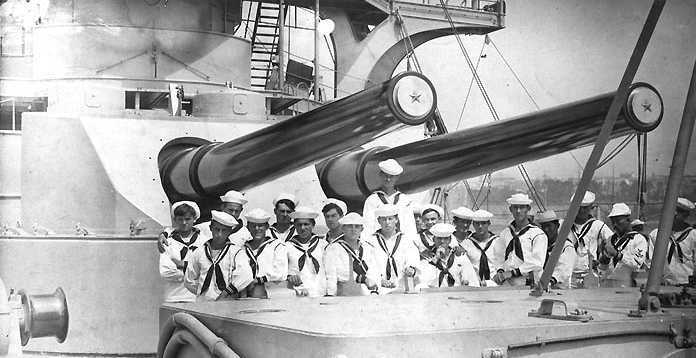 Practice shoot aboard USS Seattle ACR-11 circa 1916. Note how "Washington" has been crossed out. She was renamed "Seattle" on 9 November 1916. Bain News Service Photograph as Library of Congress Photograph ID LC-DIG-ggbain-09615. Bow turret of USS Tennessee ACR-10 about 1907-1908. U.S. Naval Historical Center Photograph # NH 94013. Bow turret of USS Memphis ACR-10 (ex-Tennesse) after she was wrecked in 1916. U.S. Naval Historical Center Photograph # NH 82102. 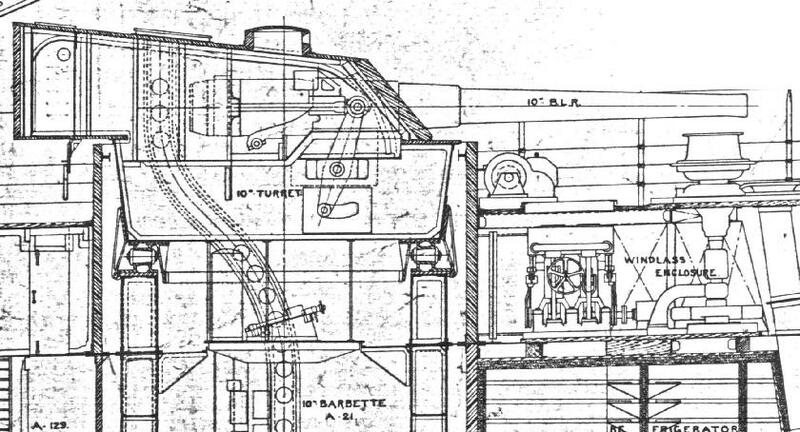 Sketch of 10"/40 (25.4 cm) turret. Note the counter recoil "grasshopper" arms and spring box.